At Associates in Dental Health, we understand how frightening it can be to experience a serious dental injury or severe pain in the mouth without warning. 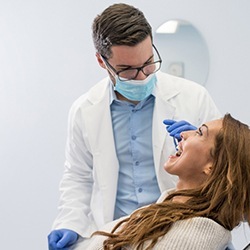 That’s why our capable dentists strive to accommodate these urgent situations as quickly as possible-- often even on the same day as the patient’s initial contact. We can also provide guidance over the phone for how to best manage your symptoms until you’re able to reach us – one of our doctors is always on-call! Please don’t hesitate to contact us if you’re in Bradford, MA or the surrounding communities. Associates in Dental Health for Emergency Dental Care? With over 30 years in business, Associates in Dental Health is well-equipped to handle a wide spectrum of dental emergencies with exceptional precision, from serious fractures to advanced infections. Plus, with three dentists on-staff who regularly collaborate to ensure the highest quality of care, you can rest assured that your smile is always in the best of hands. We’ll never leave you waiting for days or weeks without relief – our team’s goal is to relieve pain and start planning treatment right away so that patients can return to their regular routines in record time. 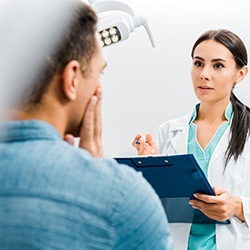 Maybe it happens on the football field or while running up the stairs to an important work meeting – one slip, and you’re suddenly dealing with a fractured tooth, a partially dislodged tooth, or even a tooth that’s been knocked out altogether. In these situations, it’s important to keep calm and not panic. The use of gauze can help reduce bleeding, and a cold compress (if available) held against the cheek can provide relief from facial swelling. Don’t wait to contact Associates in Dental Health for further help – there is a limited window of time available for reattachment and reimplantation. If you’re experiencing severe discomfort or sensitivity in a specific tooth, it’s likely that there’s an advanced infection present underneath the enamel that needs professional attention. Our team may be able to successfully preserve the tooth by performing root canal therapy; otherwise, if the damage is too severe, we can extract the tooth and start planning to replace it with a state-of-the-art dental implant or likeminded procedure. 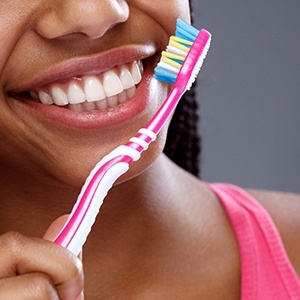 In the meantime, while it is safe to take Aspirin to manage your symptoms, do NOT place one directly on the gum tissue or tooth surfaces, as this may cause burning. Root canal therapy may have a “scary” reputation, but this procedure is actually the final line of defense that can help preserve and revitalize a badly infected tooth that would otherwise have to be removed. Our dentists will use special tools to carefully access a tooth’s inner chamber, removing diseased pulp and bacteria from within before thoroughly sealing the structure to prevent further harm. The final touch is the placement of a custom-made dental crown to provide lasting protection and a lifelike restoration. We use advanced digital technology and modern tools to ensure a safe and smooth extraction process from beginning to end, and oral conscious sedation is available upon request to help patients remain at ease.